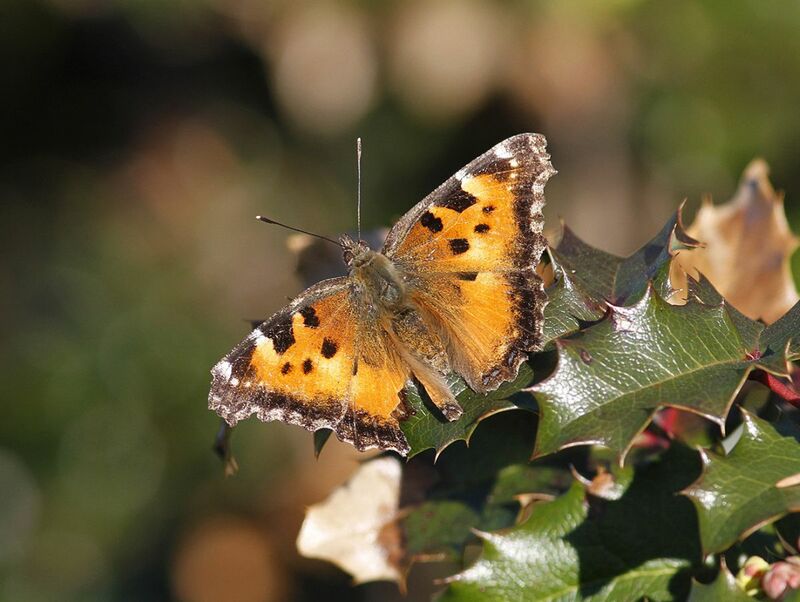 Marie O’Shaughnessy writes: Here are three examples of Kirsten Mills’s beautiful California Tortoiseshell find today, March 20th, at Mount Tolmie at 5.30pm. Seen close to the reservoir. One was hovering and settling on Oregon Grape. I only saw two, and they were different as seen in the photos I have submitted. I also saw a Mourning Cloak in Outerbridge Park around noon, March 17th, but it flew off before I could get a photo of it. 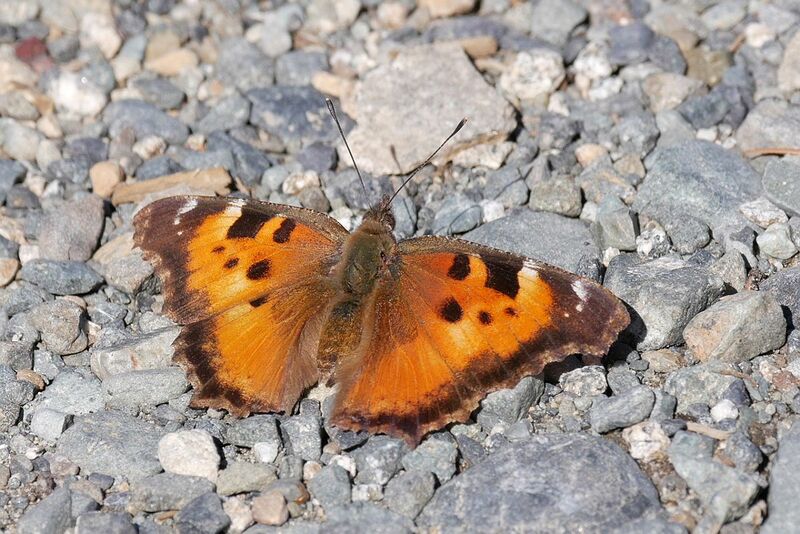 Mark Wynja writes: On March 20th at km 25 of Nanaimo River Road I observed a California Tortoiseshell. It perched on my vehicle, tripod, my hat and back repeatedly. At one point I also had to remove it from the open trunk of my car. Jeremy Tatum writes: I don’t think I have ever done three postings in a day before – but this one can’t wait. It is hill-topping time on Mount Tolmie again. At 4:30 this afternoon, three apparently pristine-fresh California Tortoiseshells were besporting themselves on the reservoir atop Mount Tolmie. They were putting on a tremendous display, chasing each other around, and showing off their beautiful wings. They were attracting the attention of other people o n the reservoir – it has to be pretty spectacular for that to happen. When I got there at 4:40, Kirsten Mills was already there and she had already photographed one of them, seen below. 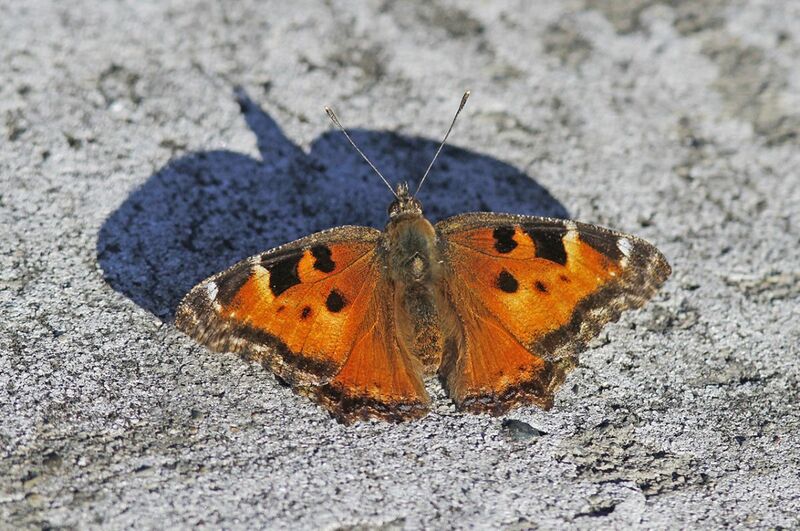 Butterfliers should note that nymphalid and other butterflies typically hill-top in the late afternoon and early evening. As well as Mount Tolmie, it would be worth checking Mount Douglas, Christmas Hill and Highrock Hill. 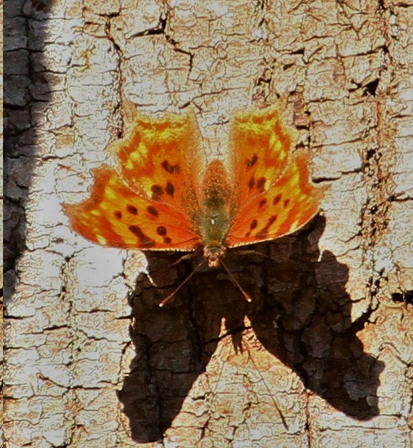 Kirsten Mills writes: Today on Prospect Lake Road there was a Satyr Comma [or possibly a Green Comma? – more likely in that area. Shall we say comma sp.? Jeremy T] and 2 Cabbage Whites around 2:45 pm. Satyr Comma Polygonia satyrus (Lep. : Nymphalidae) Ron Flower. Just at press time, more reports of commas are coming in, with the usual difficulties of identifying them! 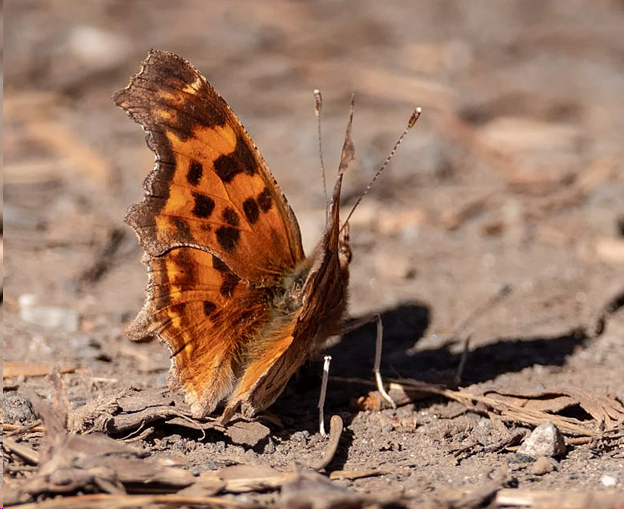 Yesterday Jochen Möhr saw a probable Green Comma in Metchosin, and Gordon Hart saw a definite Green Comma again in the Highlands. 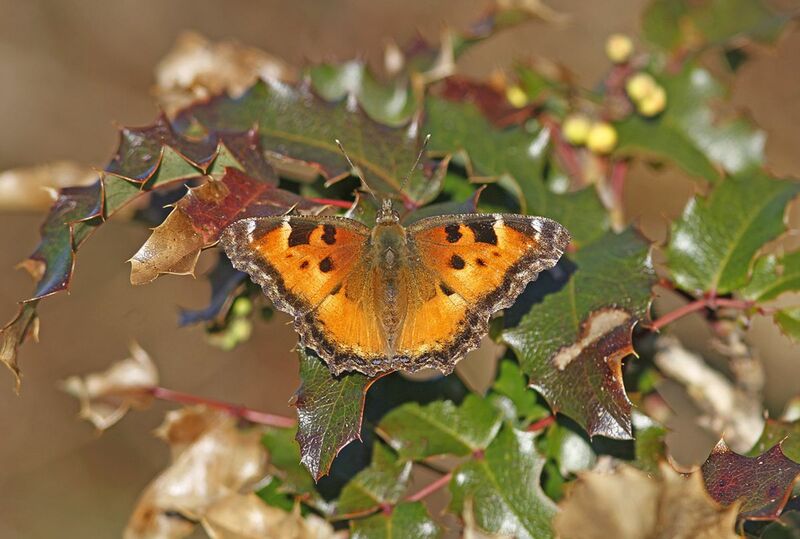 Gordon also saw and managed to photograph a certain Satyr Comma at the northeast corner of Swan Lake. Satyr Commas used to be very common, but in the last two or three years they have become quite scarce. IMPORTANT NOTICE! 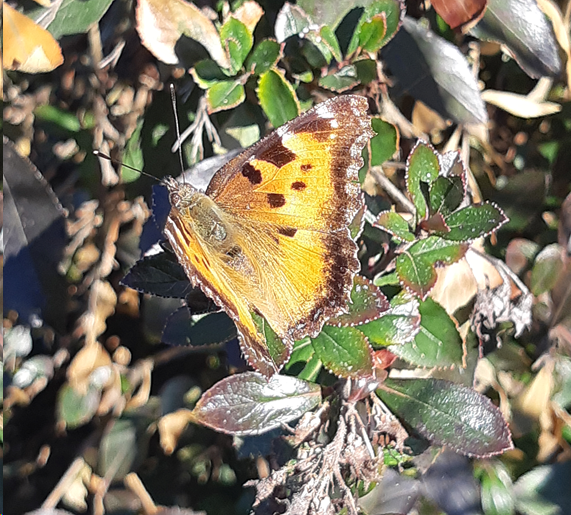 We are pleased to say that Sonia Voicescu has, at my request, undertaken to submit our local butterfly observations to eButterfly. Below is a message from Sonia explaining all about it. Most contributors to Invert Alert are not participating in any formal scientific survey, but are submitting what are called “incidental” (but nevertheless very important!) observations. In that case, just carry on exactly as you do now – just send in your sightings or photographs to Invert Alert in the normal way, and Sonia will look after the rest, though it helps if you always remember to give the date and location of your observation. If you are doing any sort of more systematic counts or surveys, Sonia’s notes below will be a good guideline. Even as Jeremy Tatum types this, Sonia tells me that she has just seen her first Cabbage White of the season – behind Saanich Municipal Hall, and she has already submitted it to eButterfly! I have yet to see my first butterfly. Here is Sonia’s notice. Let’s give her a big thanks. 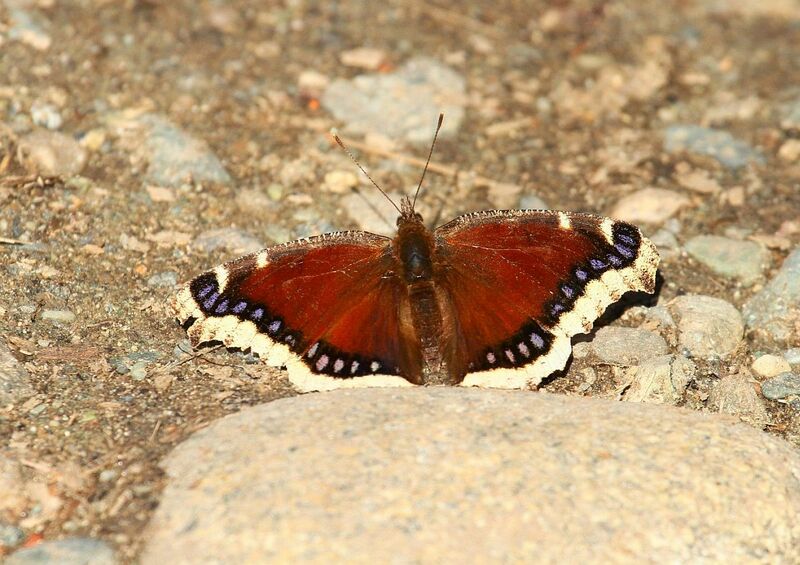 "Hello everyone, my name is Sonia Voicescu, I am an Environmental Studies student at UVIC and will be taking on the role of submitting all VNHS butterfly observations to the eButterfly (www.e-butterfly.org/) platform this year. 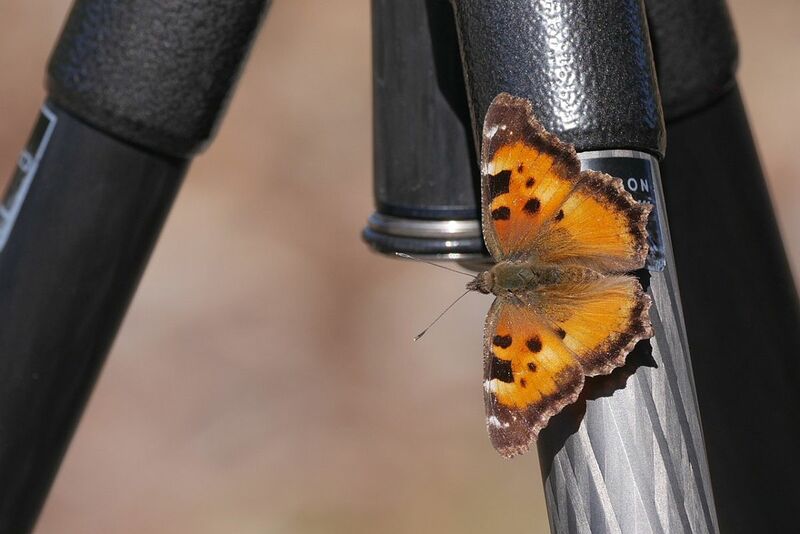 eButterfly can be a fantastic tool for observing the diversity and abundance of butterflies, and could potentially also be used for monitoring of certain species, if properly standardized. 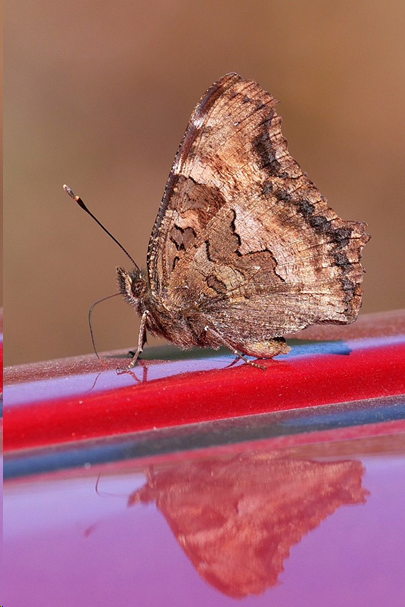 Since we have many keen butterfly oberservers here in Victoria, it seemed like a logical idea to contribute our observations to this platform! My task will therefore consist in uploading the information submitted to InvertAlert onto eButterfly. 1-Location of observation(s). The more precise this is, the better. An exact address/location always helps, however I understand if some of you may not want to disclose the address for a private residence, in which case the intersection of nearby streets helps. 2. Time of day. If possible, please record the time of day you made the observation(s). 3. Type of survey. From what I have seen so far on InvertAlert, most observations submitted are "Incidental Observations". However, if you are performing a particular type of butterfly survey, please let me know. See below the different types of surveying as outlined by eButterfly. You traveled a specific distance – walking a trail in a green space. You surveyed a defined area, often performed when covering the same ground repeatedly during a specific amount of time. A Timed count is one in which you know how long (time start and end) but no idea of area or distance traveled. 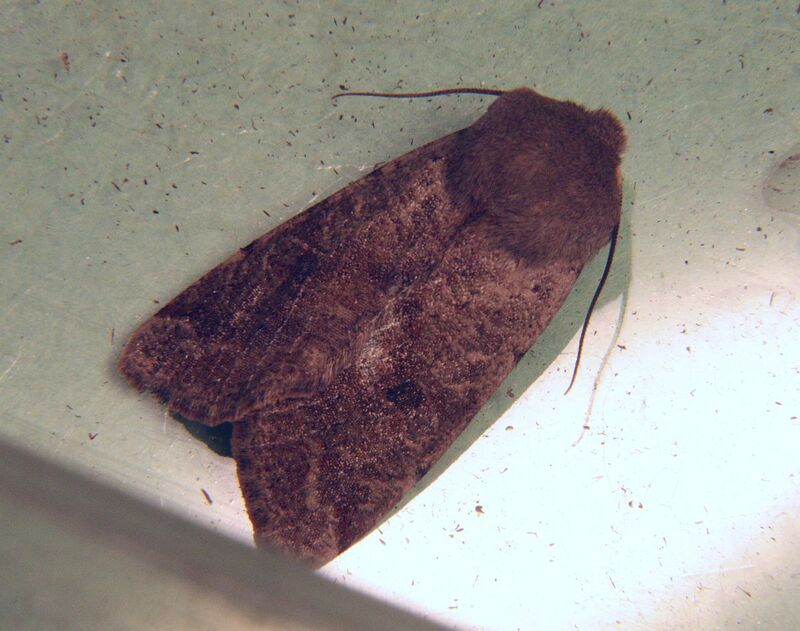 Butterflying was your primary purpose, but you cannot estimate start time, duration, and distance; use Traveling or Stationary if you can estimate these. 4. Pictures. I will only submit pictures which were already submitted to InvertAlert. Some of you take beautiful pictures and I will ensure that the photo credit is properly given on eButterfly as well. There’s quite a bit of detail in there but hopefully that will make things easier as the season progresses. I have just checked and we are the first ones to actually submit any information in the Victoria/Saanich Peninsula area! Very exciting! 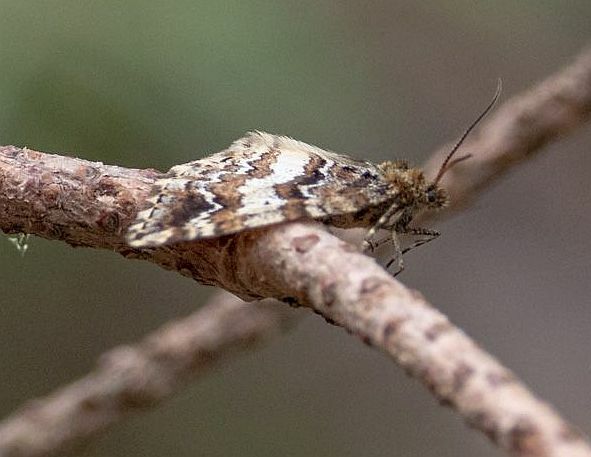 Gordon Hart sends a photograph of a Tissue Moth from the Highlands, March 17, and an Enchoria lacteata from Francis/King Park, where there were several on March 14. He reports two Green Commas from the Highlands on March 18. Margie Shepherd tells me that she saw a Sara Orangetip in her garden just south of Mount Douglas yesterday. I know some people say that spring starts when the first Orangetip is seen, but, while I do sympathize with this view, as an astronomer I have to insist that spring starts tomorrow, Wednesday March 20, at 2:58 pm PDT, precisely at the instant when the Sun crosses the equator. 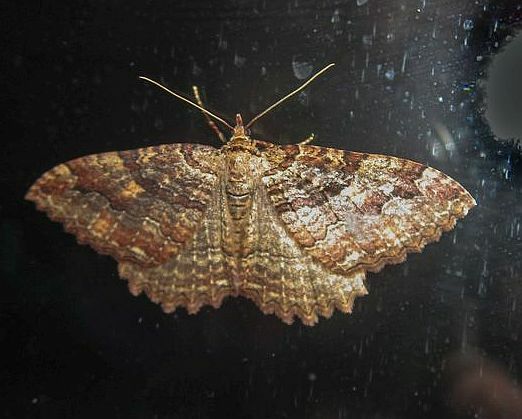 Jeremy Tatum writes: A rather worn noctuid moth paid a visit to my Saanich apartment last night. A bit too worn to be sure of the exact identification, but Libby Avis and I are both pretty sure that it is Orthosia, possibly Orthosia hibisci.